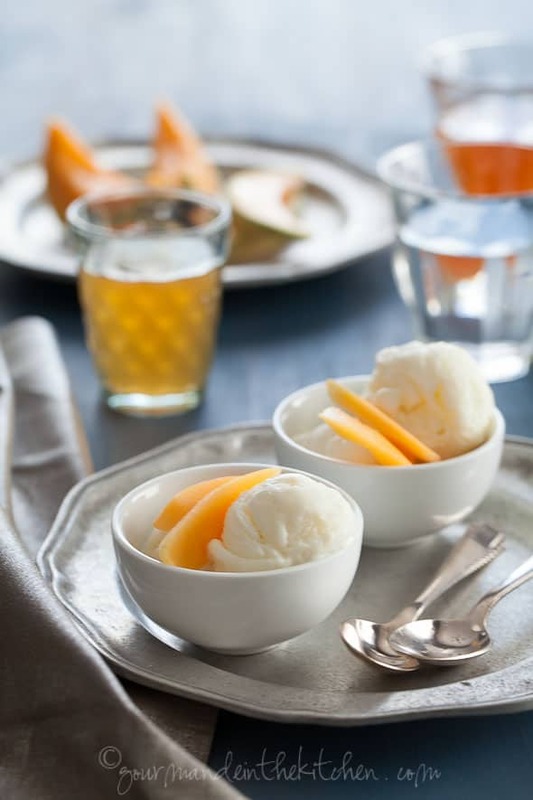 A refreshing goat milk frozen yogurt is served with white tea infused cantaloupe. I just have to say, thank goodness for frozen yogurt. Having a general fondness for frozen confections, I try to keep a stash of my “flavor of the moment” in my freezer. Between the heat and a lingering sore throat the past couple weeks it’s been my saving grace. Lately goat’s milk frozen yogurt has been preoccupying my taste buds. Even if you don’t tend to like goat’s milk cheese, I think you’ll like goat’s milk frozen yogurt. With a delicate taste that’s hard to describe, it’s a quiet comfort with a silky, smooth taste and heat and throat soothing properties. Contrary to what you might think, it’s not “goaty” or even as tart as regular yogurt. In fact ,goat’s milk yogurt has a naturally creamy texture and a mild flavor that makes for an incredible frozen yogurt. This isn’t like those cloying sweet, pumped full of air, frozen desserts masquerading as frozen yogurts. This one has a slight twang of yogurt softened by the mild taste of wildflower honey and a velvety richness while remaining light on the palate. It has a sophisticated and subtle flavor that is pure luxury and just begs to be paired with juicy seasonal fruit, and the market is just bursting with sweet melons at the moment. One of my favorites is the French Charentais cantaloupe. With its heady floral fragrance, it’s juicy and sweet and full of flavor; a real multi-sensory treat. Infused with a delicate white peony tea, I thought it would be the perfect match for the frozen yogurt. The subdued floral note of the white tea honey is balanced by the sweetness of the cantaloupe. The floral flavor of the tea lingers on your tongue for a refreshingly bright finish. Perfect for when temperatures are soaring and darn good for an irritated throat. 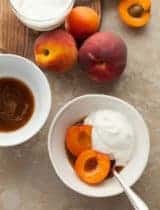 This frozen yogurt has a light twang of yogurt softened by the mild taste of wildflower honey. For the Tea Infused Cantaloupe: Steep the tea in the water for 2-3 minutes. Remove the tea bags and stir in the honey. 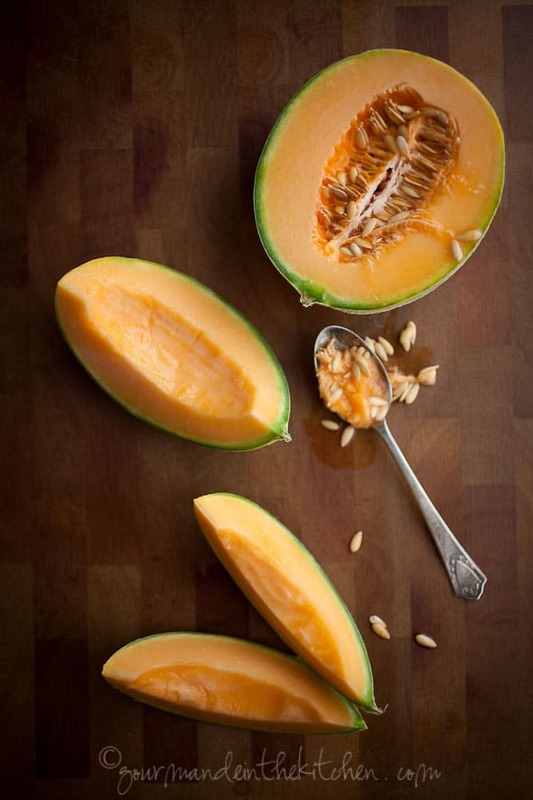 Arrange the cantaloupe slices in a shallow dish and pour cooled tea syrup over the top. Refrigerate flipping slices half way through for at least 1 hour or overnight. 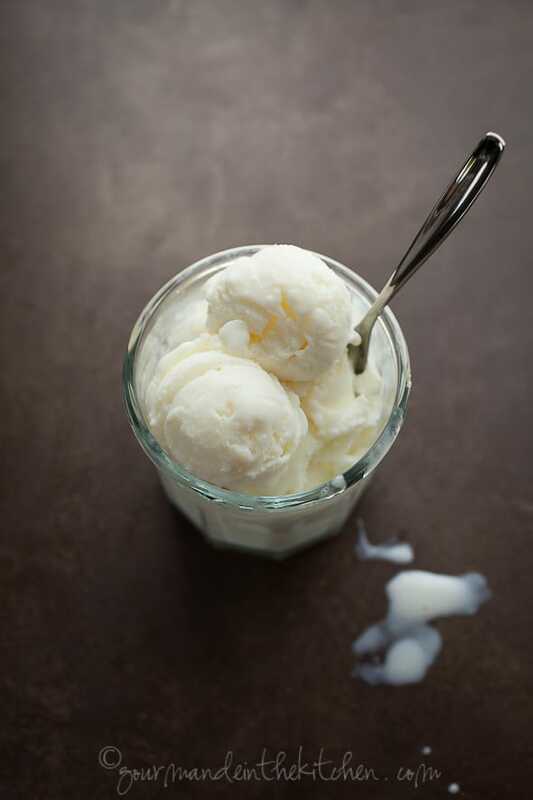 For the Goat’s Milk Frozen Yogurt: In a large bowl whisk together the yogurt, honey lemon juice and kefir. When ready to serve thaw slightly (for 5 or 10 minutes) before scooping and serving for the best texture. 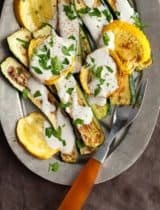 Serve with tea infused cantaloupe slices. 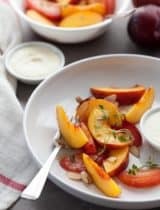 When I saw the title of the post I clicked through immediately - such stunning flavours! This is my kind of dessert, gentle and refreshing. Beautiful photos too. Just gorgeous, Sylvie. I adore frozen yogurt, although I haven't tried a goat's milk version yet. What a lovely, end of the summer dessert! I'm going to have to try out that tea-infused cantaloupe. It sounds marvelous! Oh Sylvie, Homemade frozen yogurt is the BEST! Add these gorgeous little slices of infused cantaloupe and I'm at a loss for words. Perfection! I just love the idea of infusing cantaloupe with tea! I'm afraid some of the melons I'm growing might be a little bit bland, so this would be the perfect solution. This is an amazing combination of flavors, Sylvie! I get excited just reading it! the flavor pairing sounds heavenly and as usual, gorgeous pics! I've never tried goat's milk, but have heard lots of good things about it. This would be the perfect recipe to try it in! I would have never thought to have cantaloupe with frozen yogurt! I bet that is amazing!! Hope your throat feels better soon Sylvie - I hate sore throats! Gorgeous photos, as always. This looks so good, Sylvie. The white tea, the goat's milk. Plus, the photos are gorgeous. What a beautiful creation, I love the melon and honey here! 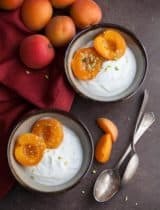 I love cantaloupe idea, but your frozen yogurt is perfect for hot days..Loving your photos, so beautiful and delicious! Love the photos and love the goats milk!!! You have made a simple frozen yoghurt into something so sophisticated. Lovely mellow flavors and I hope that throat is much better now. Such a beautiful frozen yogurt. I too love the unique and subtle flavor of goats milk in my frozen treats! My husband and I had a delightful treat of goat cheese ice cream yesterday at Ruby Jewel Scoops. I like to try this lighter and tangy goat milk frozen yogurt too. I admire your beautiful photos (always)! What a tempting summer treat! I've tried goat cheese in ice cream but never thought to use goats milk. And the cantaloupe with white tea is inspired, an exceptional dessert. I am not big lover of goat milk but I love frozen yogurt and tea. This sounds like the perfect treat for the season. Such a beautiful and delicious sounding dessert! 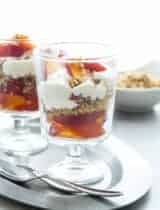 I love goats milk so I know this would be the dessert of my dreams! I was sent some goat milk yogurt last year when I did a series on goat products and was quite surprised at the flavor. While I love goat cheese, I wasn't so sure it would translate to yogurt but you're right; it seems less 'goaty' in yogurt form. Feel better soon...I feel better seeing your photos! Did you leave me a scoop? It looks fabulous! Hope you feel better soon. These pictures cool me off right away - so pretty! This is such a delectable summer treat. I tried goat milk ice cream for the first time in London, and I fell in love. I'm so glad I have a recipe to recreate it now. Thank you for sharing! What an absolutely beautiful recipe. I've used goat's milk in ice cream a couple of times now and absolutely love it - such clean, fresh flavours. Now I'm really curious to taste the goat milk frozen yogurt! I think I'm missing out. Also, never thought about using cantaloupe for ice cream or even frozen yogurt. 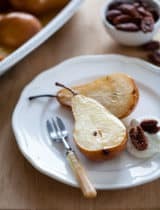 Great recipe and not to mention your gorgeous photography... beautiful work! I actually tried goat's milk yogurt for the first time last week and yes, it's not as "goaty" as goat's milk is. I made a dip with goat's milk yogurt and redcurrants and it turned out pretty well. 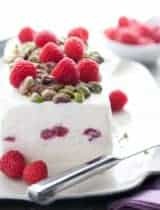 I have some yogurt leftover and would love to try making a frozen yogurt with it. Thanks for the inspiration! I share your infatuation with frozen confections and your presentation here is utterly beautiful. I have been dreaming about this yogurt ever since pinning it a few days ago. The photos are gorgeous and the flavor combo is perfection. 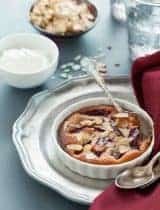 This is such a soothing dessert.. Frozen yogurt and melon... Perfection!!! I can smell the sweet freshness of this deliciousness from the pics!!! Sylvie, I can't wait to try this recipe. Goat's milk would add such a wonderful flavor! Gorgeous flavours Sylvie! I love the combination especially with cantaloupe. Beautiful pics too! I am loving these shots. 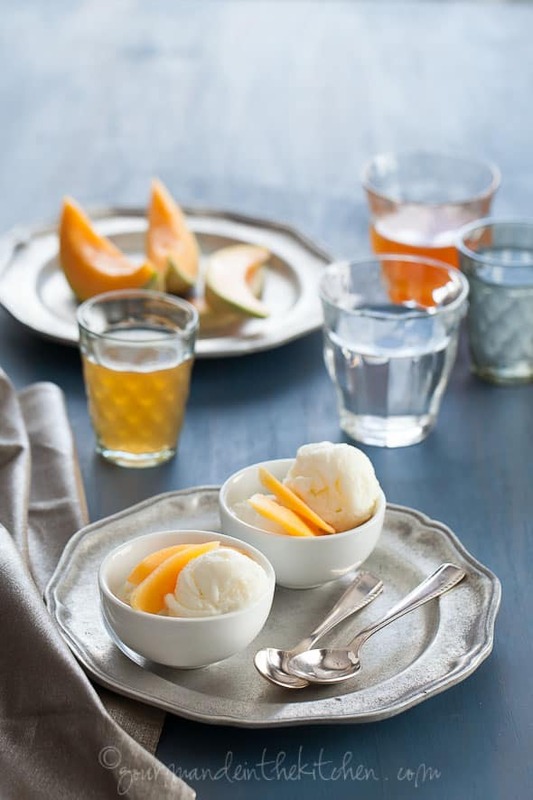 That cantaloupe shot and cup of ice cream shots are special! I don't even want to get into this recipe because I'll just melt into a puddle! Yum! Love that you added goat's milk to frozen yogurt...I love goat cheese and am always trying to incorporate it into something...I need to look into goat's milk. Beautiful as always, Sylvie! I made the frozen yogurt this morning with stow bought yogurt and homemade raw kefir. It's fantastic, and doesn't need the fruit. (I'll bet the fruit is delish; I just didn't have it on hand.) I will make this again! Thanks for sharing a great recipe!